A patrol is organized to perform specific tasks. It must be prepared to secure itself, navigate accurately, identify and cross danger areas, and reconnoiter the patrol objective. If it is a combat patrol, it must be prepared to breach obstacles, assault the objective, and support those assaults by fire. Additionally, a patrol must be able to conduct detailed searches as well as deal with casualties and prisoners or detainees. The leader identifies those tasks the patrol must perform and decides which elements will implement them. Where possible, he should maintain squad and fire team integrity. Squads and fire teams may perform more than one task during the time a patrol is away from the main body or it may be responsible for only one task. The leader must plan carefully to ensure that he has identified and assigned all required tasks in the most efficient way. (Source: SUTS2 – The Small Unit Tactics SMARTbook, 2nd Ed. / www.TheLightningPress.com). Every patrol is assigned specific tasks. Some tasks are assigned to the entire patrol, others are assigned to subordinate teams, and finally some are assigned to each individual. An individual will have multiple tasks and subtasks to consider and carry out. Security is everyone’s responsibility. Having noted that, every patrol has a troop walking in front. This troop is called the pointman. He is responsible for making sure the patrol does not walk into enemy ambushes, minefields, or similar. The pointman has forward security. 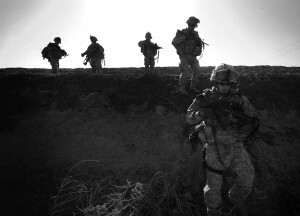 Sometimes a patrol will send the pointman with another patrol member to walk a short distance forward of the patrol. Also, every patrol has someone who is last in the formation. This troop is called the dragman. He is responsible for making sure that no patrol members are left behind. He also makes sure that the enemy doesn’t surprise the patrol from the rear unnoticed. The security team is responsible for specifically pulling security to the left and right of the patrol. This is a critical task when crossing danger areas, so a specific team is identified to conduct this task. The clearing team crosses the danger area once the security team is in place. The clearing team has the specified responsibility of visually clearing and physically securing the far side of a danger area. It’s important so another team is designated to conduct this task. Obviously someone needs to make sure the patrol is headed in the right direction and that we don’t travel too far. This is the job of the compassman and paceman. Typically the compass and pace team is positioned immediately behind the pointman. Additionally, a secondary compass and pace team is usually located in the back half of the patrol. The PL and a radio operator (RTO) make up the command team for most patrols. Doctrinally speaking, the APL is also part of this team but the APL is normally positioned near the very rear of the formation to help the dragman and ensure no patrol member is left behind. Someone has to help pull wounded buddies out of harms way. There are usually two members of each fire team designated as aid and litter teams. These teams are spread throughout the patrol and have the responsibility of carrying and employing extra medical aid gear. EPW teams are responsible for controlling enemy prisoners IAW the five S’s and the leader’s guidance. These teams may also be responsible for accounting for and controlling detainees or recovered personnel. There are many different specialty teams that might be assigned to a patrol. Trackers are just one such resource. Explosive ordinance details (EOD) are another. Trackers are unique, however, because they are generally positioned just ahead of the pointman on the patrol. The support team is outfitted with heavy, crew-served weapons on the patrol. Of course, reconnaissance patrols usually do not make use of a support team. But when a support team is required, it will be positioned to the center of the patrol. Reconnaissance rarely ever needs an assault team. The assault team may be dispersed throughout the patrol, but ideally is situated toward the rear. This is because the assault team is typically placed on the objective last.